The reasons I like John Grinsel, and just hope he stays with us on the Silverwing600 forum for many years. 1. John speaks his mined and is not timid in his approach in getting his thought out. The truth has away of hurting peoples feeling from time to time. Sometimes that is what is necessary to get change to occur, to correct a wrong, to point out our weak points. We all live with weak points, weather in ourselves or in the world that we have grown to except. Always speak out John…We do listen. 2. John is not a game player. He does not use other members like puppets. A few people on this forum use others like hand puppets to archive their goals of stifling the voices and ideas of other members. I will always respect you for this John. 3. There is no jealousy in John’s ways. He does not try to create problems between other members here. Straight talk and opinions. Time tested results of years of road and highway riding all over this world; he shares with us all freely. Thank you John for sharing your experiences with us all. 4. Perseverance of high honorable character. John you’re a stand up person of deed and character. I read it in your reviews and responses to questions posed you. As a retired Army soldier myself, I salute you Sir. 5. We all know of your years of motorcycle and scooter riding. 1.6 million miles and counting. John you got allot of grit to do that many miles. I just hope by the end of my life, I could say I’ve done even half that many miles. 1.6 million…WOW. John…Thanks for being here with us…we are better forum for having you with us. Dang, you scared me, Sknrdtec. Thought for a second that something had happened to John and this was a eulogy of some sort. John comes across a little authoritarian but 300,000 miles does build credibility. HEY DENNIS. Forgive and let bygones be bygones. I did. Life is too short. I have always liked John and glad he stays here on the site. 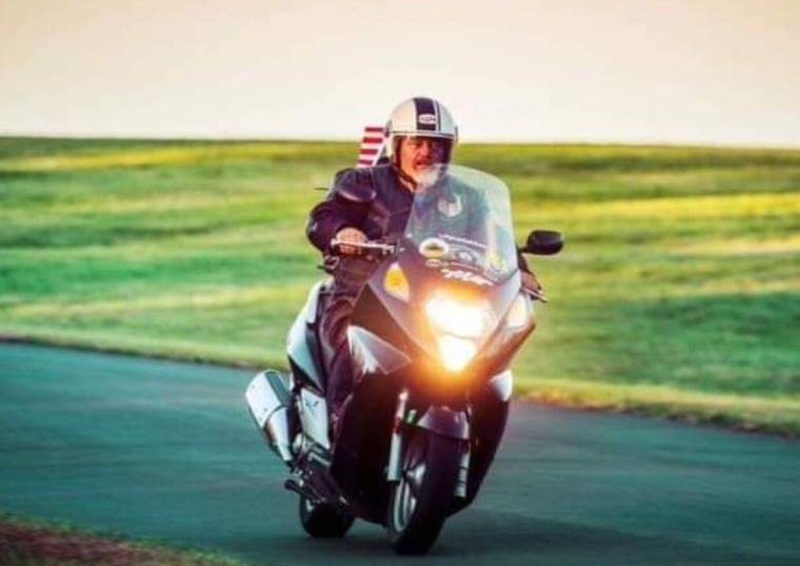 He sure does put a lot of miles on his scoots and tells it like it is. As for Dennis, I still can't figure out why he just left us. I know sometimes this site has had people that would start crap but I really wish Dennis would come back. He was a great contributor and made some cool things for the SWing. For those that don't remember he was a mod for some time and was a good one. Sure wish he would come back. I believe that he went the way as did others from this forum. Seems like there were disagreements with a few members and the moderators of this forum and they choose to leave. It became necessary for the moderators to take a firm stand against a handful of people hell-bent on causing trouble, perhaps even destroying the Forum. It was not a pleasant time and a few members drifted away, hardly surprisingly. One of the spoilers tried to sneak back in subsequently but was spotted in time. Since then, the Forum seems to have reverted to its former, friendly style, albeit with the usual little bit of 'disagreement' from time to time. Rest assured, the moderators are ever vigilant. Funny not but there are other forums that have or had the problem also. This is a GOOD one don't change. People do lose interest and move on to other things, maybe that's all it is with DennisB. I lost interest in bikes and got into maxi scooters 20 years ago. So my previous 22 years on bikes are pretty much irrelevant to me now apart from nostalgia. As I came up to retirement I threw out piles of MZ Riders Club and BMW Club magazines I'd hoarded since the Seventies, treasured rally T shirts became cleaning rags, and I threw out out all sorts of junk I'd previously thought I needed. A MZ ETZ 250 gathered dust in my garage for 15 years before I got round to selling it. In hindsight I should have got rid of all this stuff years before I did because I don't miss any of it once it had gone. After a few years riding 400 and 650 Burgmans, I now haven't the slightest interest in them and never got this 'Burgman Grin' when I had them. Now I'm coming to the end of my time with the Silver Wing, that's the way it goes. Cleaning rags!? But...but what about your new Disney T-shirt? I'll admit to occasionally slobbing around in an old Grumpy T shirt back home bought on my last visit. I'm no longer a fan of cotton T shirts covered in graphics although I do have plenty at home. I prefer the vast range of synthetic Under Armour T shirts I can buy here, mainly for wearing to the gym back home. Out here in the heat of Florida I'm more of a Tommy Bahama kind of bloke. Sometimes other things come up and suddenly you remember you haven't been here for years. I´ve benn registered only since last September, but have noticed that there´s this kind of hazard of the topic to flame up especially if someone´s trying to modify his/hers SW more that isn´t accepted by some members. I´ve have read this forum quite a lot and the phenomena has been there every now and then. I prefer it to be neutral or at least not hostile or nasty. It's words, differences of opinion, or views, and nobody has been harmed. If you take anything too seriously said on any forum you really need to woman up or stay in your Nordic bubble. It's pretty insignificant getting worked up and using words like hostile, nasty, hazard, and flame about a few posts about scooter stuff. In the real world there's real problems like what happened in Manchester a couple of days ago. Yes 'Her we go again', you trying to stir things up... which she's now corrected to 'Here we go again'. A S Holes are like opinions - they all have one. Sorry Meldrew, I noticed my clerical error immediately and corrected it because of that. I use the ten-finger system and make mistakes every now and then as many of us do. Anyways, if you find my posts so irritating, please ignore them. Leena, you'll have to cut Uncle Meldrew some slack. Sometimes he forgets to take his meds. Good idea ... but being retired and a sort of house husband I do have other interests apart from the Silver Wing. I'm currently in Stuttgart, Germany with Mrs M and some of the family. I could visit the Mercedes-Benz, and Porsche Museums while I'm here, but if you've seen one car museum you've seen 'em all. Except for Don Garlits' Museum of Drag Racing. ... snipped ... I'm currently in Stuttgart, Germany ... Tchuss. Copy and paste it in Google. Dennis showed up for awhile again and now disappeared again. Hope all is well with Dennis. He sure helped quite a few people here over the years. I see many of his posts are still relevant as his focus was on "how to" not "you shouldn't do that." The reference to tyres on drag bikes looking like car tyres is irrelevant; drag bikes do not go round corners in the race. Valid points regarding manufacturers fitting car tyres to motorcycles or not are being rubbished without foundation. It's time to draw this thread to a close since any reasonable, reasoned arguments are being brushed aside to be replaced with theory. I say this as a moderator and administrator, appointed by others; if you don't like it, go elsewhere. Sniping at moderators is not tolerated here. Those are the rules - abide by them. Yes but he was posting stuff and selling his home made bits like the sat nav mount I bought from him soon after I bought my Silver Wing in late 2010. He'd disappeared long before you joined the forum in June 2016. Another example of how you like to rub people the wrong way on purpose. I think you earned the "ignore" function. Bye bye. Final word: DennisB's John Grinsel post was made in March 2011; Sknrdtec's post was in May of 2016. Dunno why anyone would bring back old posts and cause so much contention, but this topic is Locked.